Phase II treatment involves assuring that each tooth is in its proper position in the mouth and is in harmony with the lips, teeth, tongue and other teeth. This phase is usually started when most or all of the baby teeth are lost. • Metal braces: These are the most common type of braces. They are much smaller and more comfortable that those of the past. 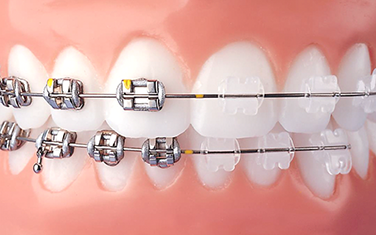 Metal braces straighten teeth using metal brackets and archwires. They also allow for the option of adding colored elastics (which are changed at each visit) to create a unique smile. • Ceramic braces: These are less visible on teeth than metal braces, making them a good esthetic choice. They are mostly recommended for adults, since they are more fragile. Like metal brackets, ceramic brackets are used along with archwires to help straighten the teeth. • Herbst appliance: This is an appliance that is used in conjunction with braces to help the lower jaw develop in a forward direction. The appliance is fixed to back molar teeth, and includes a metal tube that connects the upper and lower jaw. Adjustment of the tube allows for control of the lower jaw’s position in relation to the upper teeth.